A line from Dangauerovka district to Vladimirskiy settlement along Vladimirskoye Shosse (now Shosse Entuziastov) was built in 1930. A few years later the line was expanded further to Perovo and Novogireevo, but the reversing loop was spared from the doom of many other such intermediate termini and has been existing until today. A small wooden building for the control room was also constructed here in the second half of 1930s, but it exists no more. 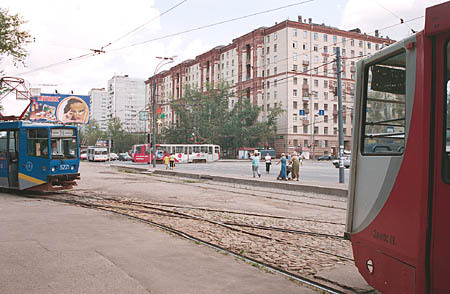 The loop is located at the crossing of Shosse Entuziastov and, of course, 3rd Vladimirskaya Street. The line along Shosse Entuziastov makes here a right turn to Perovo, leaving a vast Izmailovo forest to the left. 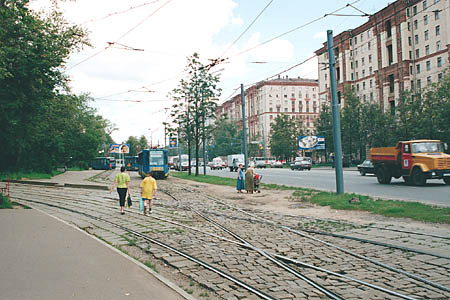 The terminus has two through tracks and a stub; more interesting is the fact that the tram traffic along the loop is clockwise (thus leading to necessity to have an extra crossing). This is one of only two of such termini in Moscow, the second being Sokolniki loop. Looking eastwards from the city centre, the main line turns left before making a right angle crossing with Shosse Entuziastov. The single track exit from the terminus and the extra crossing are seen in the foreground. Now - an entry to the terminus where its two tracks divert. 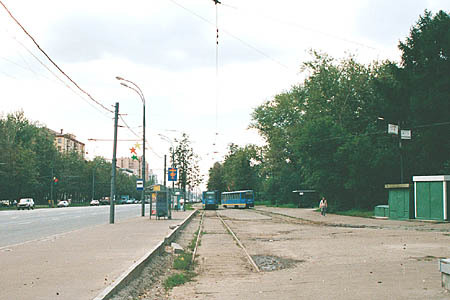 A stub track can be seen a few steps farther, and a tram crossing Shosse Entuziastov en route to Novogireevo is even more distant. The closer view of the stub track. It does not look like being used regularly, but anyway this adds some 'spice' for the very predictable track configuration of Moscow tram network. This schematic diagram displays a track configuration of the terminus.